2) Measure the widest part of your ribcage. If this measurement is larger than your underbust use this measurement instead. If you get stuck, we’re here to help! Send us an inquiry via the Size Inquiry Form below. If you dont want to wait for a recommendation, you can also get some instant recommendations from our handy CORSET CALCULATOR! Click HERE to learn more. How Do I Measure For a MCC Corset? As a general rule, please remember your corset will be centered on your waist. In order to find a proper fit you will need to measure yourself for the specific corset you’re looking at. Most of our corsets are measured at 3 distances. 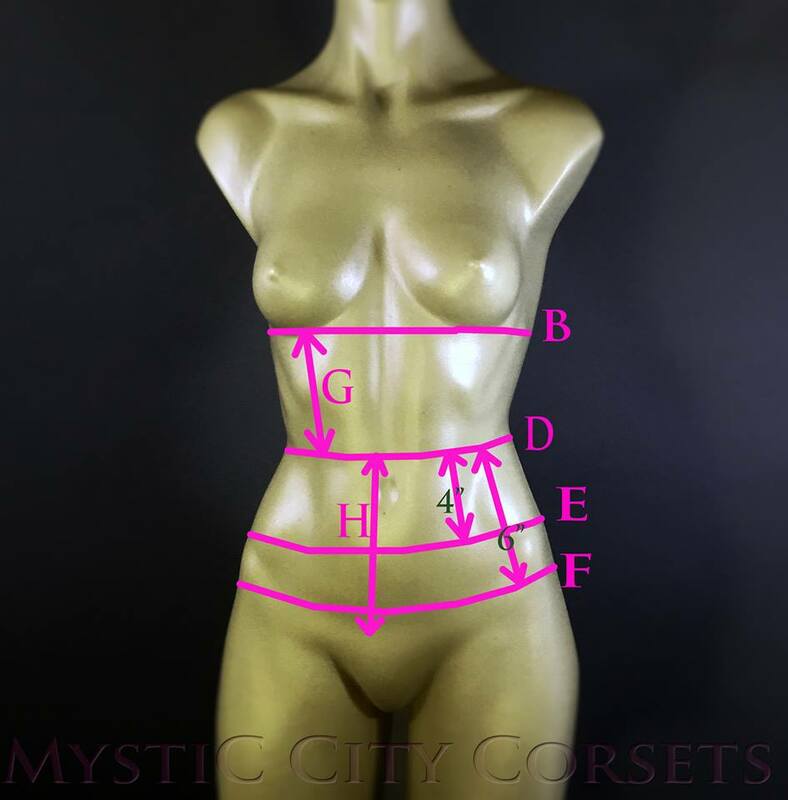 The underbust, 4″ below the waist (upper hip), 6″ below the waist (low hip/full hip). The underbust length varies depending on the model of corset you choose. Please refer to the sizing images and measure at the appropriate distance from the waist for that design. We understand not everyone’s proportions are the same (which is exactly why we offer so many varying lengths and silhouettes) so we ask you to measure yourself to fit the corset you want to wear. These distances don’t necessarily sit at the edge if the corset, but instead at the distances we measure for our sizing chart. Please review the size chart and you will see the specified distances from waist located in the head column. You can also use our diagram images for each product as an additional tool. Here is an example of a diagram image. What Is an Underbust? And Why Do I Need To Measure Its Length? The underbust is the area located below the bust (or pectorals on those without a bust). We use the vertical length from right below the bust to the waist, to determine if you’re long or short-waisted. Some corsets will be patterned for a long or average underbust length. Other corsets will fit all body types vertically (without being too long) but can be on the shorter end. If you’re concerned with a corset being too long or too short (leading to a bit of fluff below the bust if the corset is truly centered on the waist). 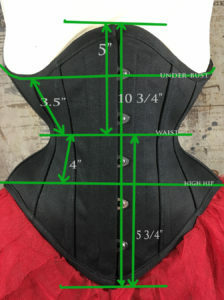 Please remember to take this measurement, and compare it to our sizing diagrams for each corset you may be interested in. When measuring the waist keep in mind it is located in the space between the ribs and hips. Since floating ribs are fairly hard to detect, it is easiest to find your iliac crest (top edge of the hip bone) and feel above this area you will find is more “squishy” (generally 2″ above, or 4″ above the upper hip) this space is pretty standard on everyone, considering the waist is always in relativity of the upper hip. The ribs are what tend to differentiate in length from person to person. Remember the waist isnt always your smallest measurement. You’re not looking for the “visual” waist (also known as the apparent waist). You’re looking for the skeletal waist. If you have any questions feel free to contact us via our sizing form, we will happily assist. I Was Recommended a Certain Size Corset. Can i Choose Any Corset In That Size? Unfortunately, not every corset is created equal. A corset which is curvier will have a larger capacity to reduce the waist, than a corset with less curve. Your best bet is to take your measurements and compare those to that of the corsets we offer to find the closest fit. I Recommend you check out our Corset Calculator to narrow down your options. Then review the corresponding size charts to determine size, and preferred length. Can I Order a Larger Size for Extra Length? Unlike standard clothing, a corsets length doesn’t vary from size to size. Each corset has a set vertical length, each size has varying circumference. Why Would I Want a Cupped Rib Corset? Conical Corsets Look So Much Nicer! No one can argue the conical rib shape is classic. The decision rests mainly on if you intend to rib train (train your floating ribs to rest inward more) and if you can tolerate pressure on the rib. Most of our corsets (even conical) are slightly contoured to fit the rib comfortably without placing as much pressure on the ribs. This allows for longer duration of wear for waist trainers, and also allows for a greater ability to reduce. Many of our customers have found our corsets allow for a much more dramatic curve than more conical OTR(off the rack) makers. On that note, we do offer both conical, cupped, and slightly cupped silhouettes in our collection. It is our goal to offer something for every body type and preference. What Length Corset Should I Choose? Typically a shorter corset, a cincher, or waspie would allow for more movement. As a side effect these do offer slightly less support, however you still can achieve a classic silhouette and smaller waist without losing mobility. If you prefer a longer corset, keep in mind you may not be able to move and bend as freely but will help improve posture and overall and provide a smoother line under tight fitting clothing. Should I Choose a Corset with a Stiff or Flexible Busk? What you plan to do while wearing your corset will impact this decision. A stiff busk will offer more support, but will also hinder some movement while laced. A stiff busk is generally better if you prefer maximum support, and do not plan to do much bending or sitting. However, a stiff busk can work on a shorter corset to still allow more freedom in range of movement and ability to sit comfortably for long periods of time. A flexible busk will offer slightly less support, but will allow for more movement. Unlike the stiff busk, a flexible busk will contour your side profile view. (bend out ward at the rib and hip, and inward at the waist giving a concave profile). I feel a flexible busk is easier to stealth, as it gives a more human shape, and is more comfortable for longer and active days. How Small Should My Corset Be? When choosing which size corset to purchase keep in mind the waist measurement is the final diameter externally when fully closed. So this will be the smallest size it can be tightened. We typically advise choosing a size 3-7in smaller than your natural waist measurement depending on how muscular or squishy you are. We recommend sending a sizing inquiry through the form below before purchasing to help best find the size, style, and cut best for your body. Please enter a value between 15 and 80. Only required for an overbust corset request. (measure where you bend-located, directly above the iliac crest) IMPORTANT! THIS IS NOT THE VISUAL WAIST.